There is nothing like an intense game of laser tag to get the adrenaline going. 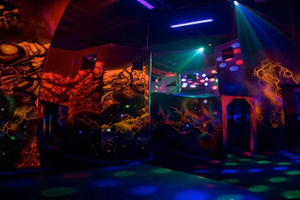 Mesa, Arizona is home to the world’s largest laser tag arena and entertainment center, Stratum Laser Tag. Gather your comrades for an entire day of laser beams. 60 laser tag vest and phasers are available for your use. The center consists of 13,000 square foot arena with 15 different levels! Interactive targets, towers, bridges, ramps, and other obstacles are strategically placed in the arena. These obstacles are ideal for either an ambush or taking shelter. The laser tag arena its self is full of incredible creativity and art work. The battle field is professionally lit with theatrical lighting which adds to the thrilling atmosphere. A portion or the arena is complete with black lights and another with strop lights. All the walls and passages have an artistic touch that fit the laser tag theme, some are even 3-D. In addition, Stratum features a high quality sound system with epic sound effects. You will literately have a blast at Stratum Laser Tag. You may also visit Stratum Laser tag twice for free with a Pogo Pass membership! A Pogo Pass allows you to visit many other intriguing places for a one time fee. Currently a Pogo Pass is 60% off with the promo code! Check it out, the Pogo Pass is just about as cool as teleportation.